For their first ever Museum Shop Sunday, Tullie House visitors can enjoy a tasting with Solway Gin, while local artist Martin Evans will be in the shop working on a digital art piece. Amateur historians can to get up close to some real Roman artefacts, with a Roman jewellery handing activity also happening. Admission to the Museum is £6.50 for adults and free for children under 18. For more information, see here. Everyone should be a fan of this offer – the National Football Museum has 10% off all in-store items (excluding signed memorabilia) on Sunday! The National Football Museum is an engaging celebration of the beautiful game, with lots of interactive exhibits to put your knowledge – and ball skills – to the test. FREE admission. For more information and opening hours, see here. The Fitzwilliam Museum has been carefully curating its collection for over 200 years, with current exhibits celebrating Virginia Woolf and first President of the Royal Society of Painter-Printmakers, Sir Francis Seymour Haden. Sunday shoppers can enjoy 15% off calendars, 10% off jigsaws and games, and buy-one-get-one-half price on advent calendars. The offer also extends to Cambridge University Botanic Garden and Museum of Zoology. Dip into the Roman world with a visit to The Roman Baths, where you will find the remains of one of the greatest religious spas of the ancient world. The city’s unique thermal springs rise in the site and the Baths still flow with natural hot water! On Sunday, shoppers will encounter costumed Roman characters and have the chance to sample a selection of goods made by local and artisanal producers, from warming honey mead to hedgerow-foraged preserves. The Baths are situated in Abbey Church Yard, BA1 1LZ. Entry fees are £16.50 for adults, £10.25 for children under 16. 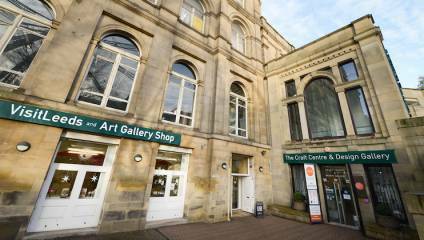 We reckon Leeds could be the perfect city to do a “crawl” of Museum Shops! For more information on Leeds Museums, see here.